Each year, the Detroit Metro Convention & Visitors Bureau presents the ROSE Award to stars in the hospitality industry who provide unforgettable customer service. 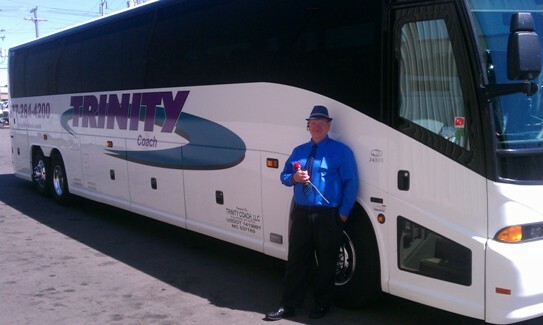 Our motor coach driver Matt Nolan is a finalist for the Rose Award. Please read the story below and go to theroseawards.com to vote for Matt. My name is Jim Smith, and our Potterville High School music department recently traveled to Orlando and the Disney properties. I wanted to congratulate you and your team for a very nice experience. In the past, we have had contracts with other coach companies and have had some “interesting” experiences. I was on the coach and Matt was our driver. Having firsthand experience with Matt, I wanted to share a couple of thoughts about him. We had a student that went on the trip with us with some very special needs, both physically and cognitively. We could not have asked for a better person to be at the helm of our coach than Matt! His interactions with Ryan were sensitive, patient, understanding and, most importantly, caring. Matt was exceedingly patient with Ryan, and I believe there was a real connection between them. Matt always took time to listen to Ryan and to speak with him in a genuine manner. It can be easy to become impatient and dismissive of a person such as Ryan, and with Matt, there was never even a hint of that attitude. Furthermore, he did a fine job of being helpful in getting Ryan off the coach, getting out his wheelchair, and helping Ryan’s mom in any way he could. Again, congratulations on a fine team!